L-R: Carlos Latuff, Eloy Govea, Frank Oltuski. L-R: Eloy Govea, Director of the Cuban Tourist Board in Canada; Michel Bernal Quicutis, Commercial Director of the Cuban Ministry of Tourism; Frank Pais Oltuski Rodriguez, Marketing Vice President of Gaviota Group; Carlos Miguel Latuff Carmenate, President of Gaviota Group; Tania Lopez Larroque, Consul General of Cuba in Toronto. "Autentica Cuba" is the tagline for the tourism board's current campaign, enticing visitors to discover the country on a deeper level than just sand and sun. Give it half a decade, and you may not recognize Cuba’s tourist offering anymore. The country is in the midst of a major initiative to build new hotel rooms, while concurrently raising the level of existing accommodations, with goals of keeping up with competitors and attracting higher-revenue visitors. 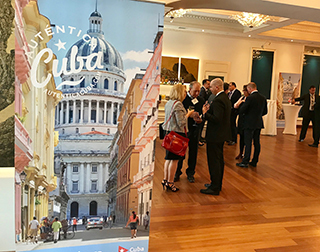 To celebrate its revivification, as well as serve as a tribute to Havana’s 500th anniversary, the Cuban Tourism Board hosted a media luncheon on 9APR in partnership with the Gaviota Tourism Group, a major player in Cuba’s hotel and resort industry. Having recently opened International Melia Varadero Hotel and the Hotel Paseo Del Prado in Havana, the company is performing extensive upgrades and improvements across all its properties. “Since last year, we worked particularly hard on improving the hotel infrastructure, increasing the quality of our products and services which includes the extension of the wi-fi connection in Cayos de Villa Clara as one of the most notable developments,” said Frank Oltuski, vice president of the Gaviota Tourism Group. 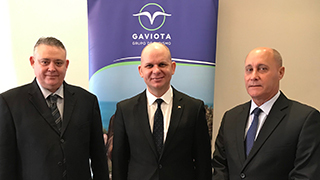 Oltuski says Gaviota, which operates roughly 50% of the Cuban hotel inventory, is building new properties with innovative concepts, modernity and design that will see the Cuba offering grow and diversify. 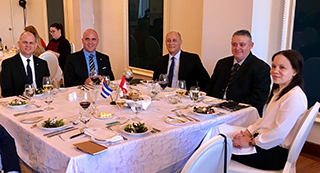 Among other hotels and chains, executives from Melia Hotels International, Islazul, Gran Caribe, Iberostar Hotels, Blue Diamond Resorts and Viajes Cuba, were in attendance. As Cuba’s main market, Canada makes up 23% of the republic’s overall 4.7 million tourists – that’s 1.1 million Canadian visitors. Cuba projects that tourism will continue its upward trend this year and Canadian numbers are already on the right track. The country welcomed 542,577 of us between 1JAN and 9APR, a growth of 3.89% year-over-year. With more than 100,000 new rooms, 20 golf courses, and 20 international marinas projected through 2030, Cuba has grand ambitions. But Eloy Govea, Director for the Cuba Tourist Board in Canada, is confident in the country’s ability to fill these rooms. As a destination abundant in rich architecture, a vibrant visual and performing arts scene, iconic spaces and pristine beaches – not to mention being the largest country in the Caribbean – Cuba has travel covered from all fronts – historical, cultural, sun and sea. It is this comprehensive product offering that the Cuban industry believes will continue to attract visitors at all budgets, including an expanding luxury option.